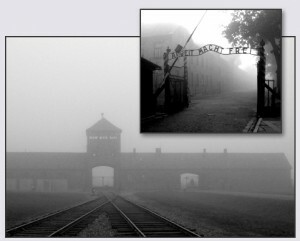 EURO 2012, Germany’s national team in Auschwitz. Team Captain Philip Lahm, Polish-born Miroslav Klose and Lukas Podolski were among the players who joined coach Joachim Löw and members of the DFB German football federation to commemorate the victims of the Holocaust at the former Nazi concentration camp Auschwitz-Birkenau on Friday. The group laid a wreath at the memorial in front of a wall where thousands of political prisoners were executed by the Nazis. “It is our duty and our responsibility to look very closely and above all to communicate again and again to the many young athletes in our clubs that anti-Semitism, racism and intolerance have no place in our society,” said DFB President Wolfgang Niersbach.